Access Points between O'Sullivan Dam and Othello, WA. 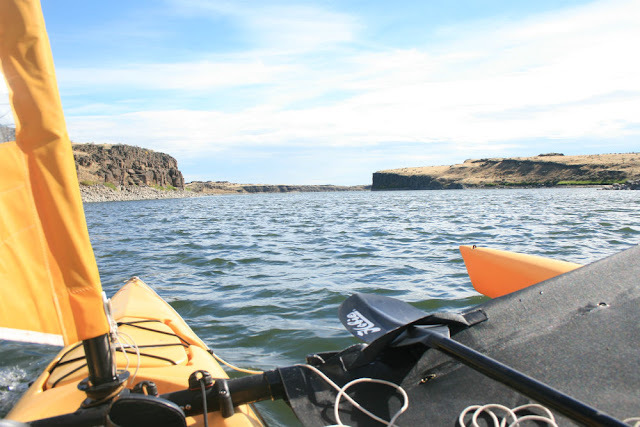 Read the article about Miles Moore kayaking and sailing the Potholes Canal and Chain Lakes by Clicking Here! sustains all forms of wildlife and recreational activity, particular fishing. 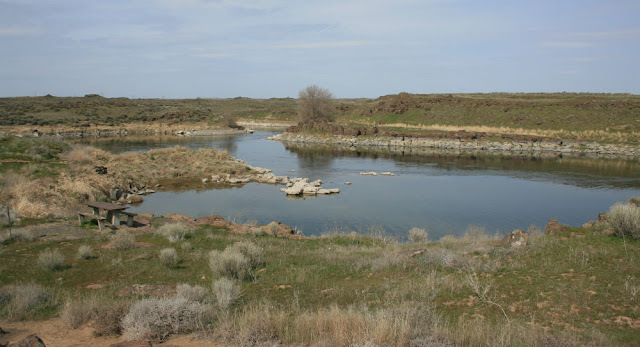 The canal runs through Soda, Elbow, Pillar, Long, and Crescent Lakes (upper and lower) creating the chain lakes, then passes by the city of Othello WA., and through numerous farms, and runs its course almost to Pasco WA. (one of the Tri-Cities) into the Columbia River. This section of the canal from O'Sullivan Dam to Othello is popular for kayak touring during the times of the season when the current slows. The starting points for entering the canal either starts near the O'Sullivan Dam or at one of the Soda Lake launches (see details below). Launching near the dam is done by hiking down a primitive gravel road on the west side of the canal for a few hundred feet and then portaging down a steep bank into the canal (only suited for experienced kayakers/canoeist). 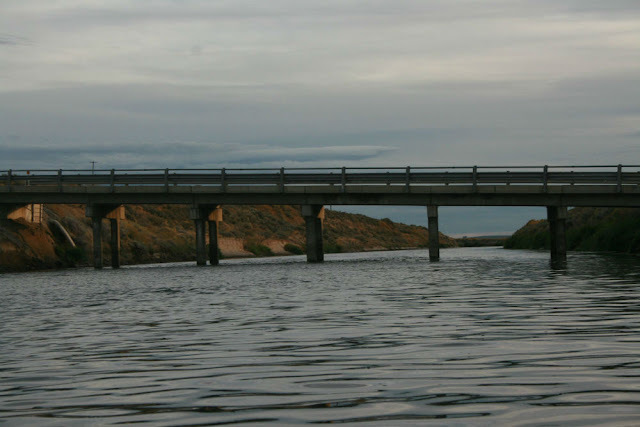 Launching at Soda Lake is where powerboaters launch and then motor up the canal under Soda Lake Road bridge toward the dam. Kayaking or canoeing up this portion of the canal is not advised due to the very strong currents you would have to paddle against. 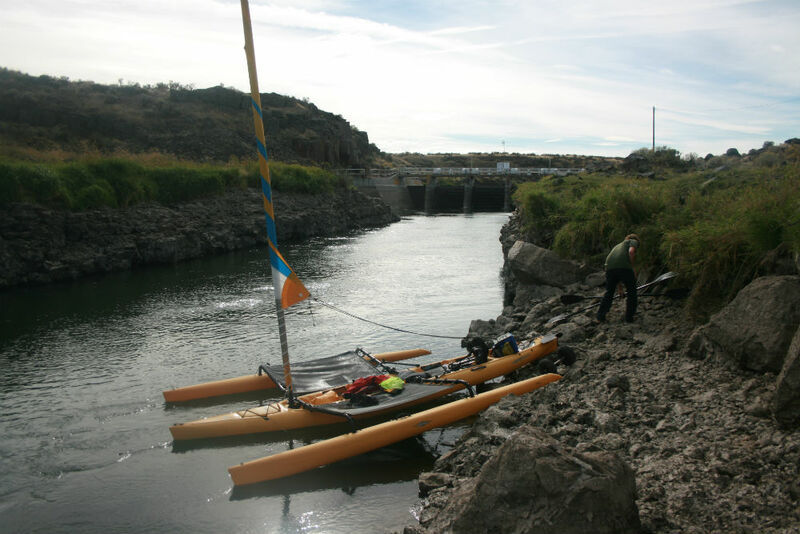 Getting back into the canal after Soda Lake is done by portaging around the small Soda Lake dam, which is a fairly easy task for kayaks/canoes but not possible for powerboats. After Soda Lake Dam the canal passes through Elbow and Pillar Lakes, which are more like ponds, than lakes, actually are just wide parts of the canal. Before you get into the next lake (Long Lake) the canal walls reach heights of 50-90 feet making it a very stunning section of the canal to boat in. Power Boaters wanting to go up the canal to Elbow or Pillar Lakes you can launch in Long Lake. Long lakes is about 2 miles long, with lots of places on the east shoreline to camp (no camping allowed on the west shore). After Long Lake you enter about a 3 mile section of the canal that passes under the Sheep Lake Road Bridge and into (Upper) Crescent Lake followed by Lower Crescent Lake either of which have a public access road available (private and closed lands to the public). 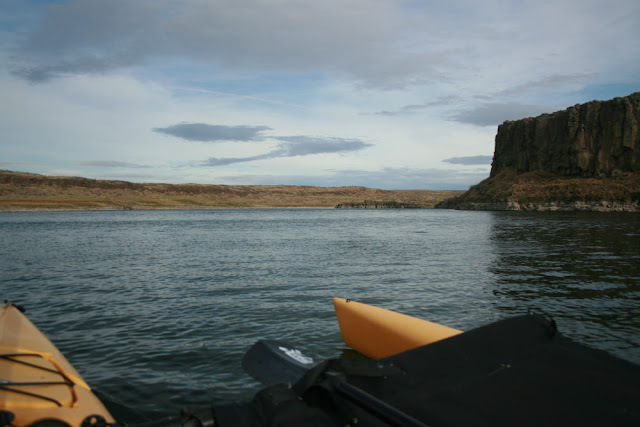 So if you are paddling you will need to go all the way to Othello an 8 mile section of the canal to be able to get out onto public land (public easement land at the mainstreet road). Power boaters of course can go into both Cresent Lake & Lower Crescent lake and then motor back to Long Lake. Power boaters be advised that Lower Crescent Lake is shallow except in the main channel. 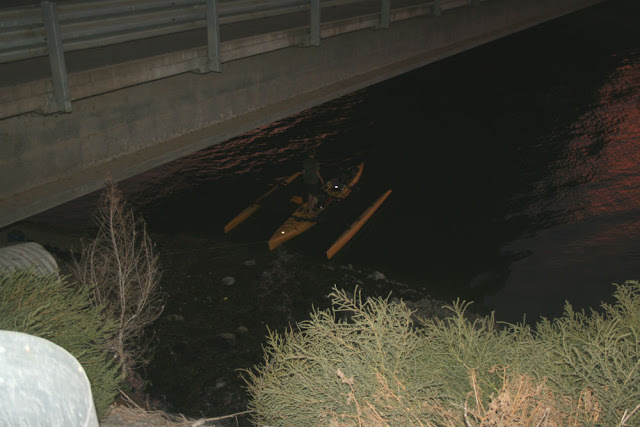 Boating in the Canal ends at Othello main street bridge. Before getting to the main street bridge you will pass under McManamon Road bridge and a steel non-vehicle bridge before getting to the W. Main Street bridge take-out. All the bridges on this canal have a clearance of about 10 or more feet. About third of the way between Lower Crescent Lake to Othello is Otter Bay a place you can stop to anchor or view wildlife. Seems a couple Otters like this not so picturist bay. Otter Bay is the only spot after Lower Crescent Lake that you can get out of the canal. Under the Othello main street bridge is a wide dirt area where one can get out of your craft. Kayakers/Canoeist can portage their craft up the bank to the road. The bank to the road is extremely steep so we recommend you tie a line to your craft to get it up the bank. Again do not pass an inch beyond the bridge due to all the pipes and low low bridges that cross the canal after the main street bridge (see pic at end of this page). 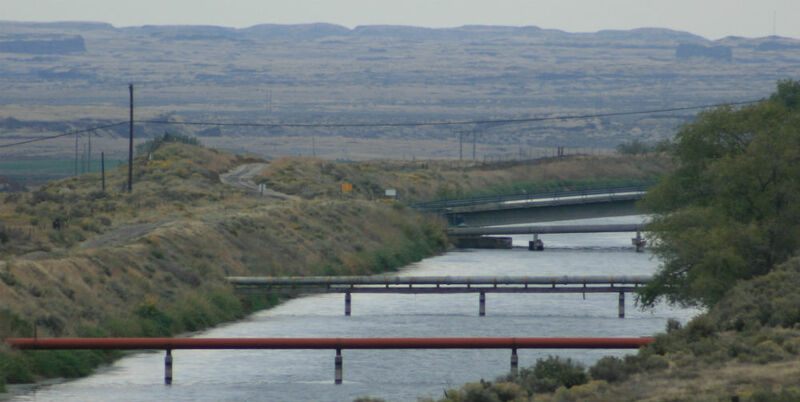 The canal depth ranges from about 10 to 40 feet. Soda and Long Lakes run a bit deeper at 20 to 80 feet. 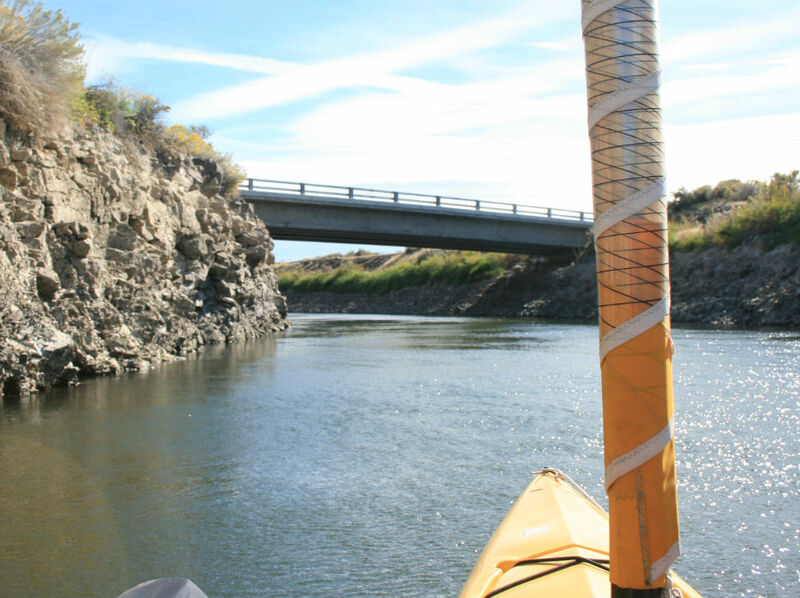 All in all the Potholes Canal is a great place to fish and paddle, and for the most part it's smooth paddling. Another note of caution is this desert area high winds are common and so check the weather report. I have actually been on my kayak without paddling and was pushed up the canal against the current. Fishing: Different sections of the canals and associated chain lakes have different fish species - From O'Sullivan Dam to above Soda Lake Dam fish species are Spiny Rays; Walleye; Large & Smallmouth Bass; Crappie; Bluegill; Perch; Whitefish; Trout; Below Soda Lake Dam through Elbow, Pillar, Long, and Crescent Lakes to Othello, WA. fish include Rainbow Trout; Walleye; Large & Smallmouth Bass; Crappie; Perch; Bluegill; Whitefish. Pillar Lake primarily seems to attract Rainbow Trout. ACCESSIBILITY: Not accessible to wheeled mobility devices. If you are not fit to climb rocks and paddle long distances this is not the place for you to launch from. This lake is the first lake in Potholes Canal Chain Lake series. It is large with lots of open water to sail, etc. 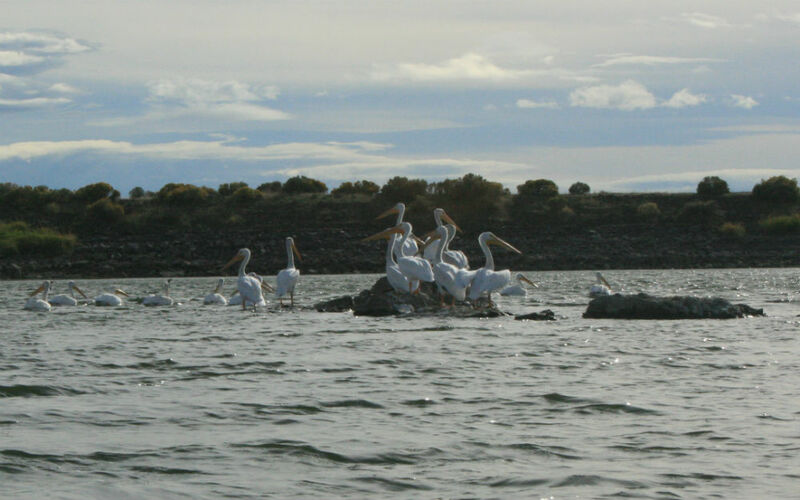 Info: Click here for more detailed information about Soda Lake. ACCESSIBILITY: PARKING... Gravel, sand, dirt combo parking areas; PATHS/TRAILS... Lots of dirt, sand, and gravel trails, none of which are designated as wheelchair accessible; RESTROOMS/FACILITIES/SHADE… One fully accessible restrooms. Covered picnic areas. No trees; DOCKS/LAUNCHES/PLATFORMS… One wide gravel, rocky, sandy, muddy launch. No docks or platforms; DIRECT WATER ACCESS… No access for wheeled mobility devices. Access water via wide rough launch when no powerboats are present, assistance likely needed. Mud is deep in the water; TRANSFER SYSTEMS... None; SENSORY... No sensory tactile markers for those with visual and other impairments; CAMPING... Developed primitive camping; O.T.H.E.R… Oddities/Barriers: Lots of sand and deep mud during wet times of the year at launch area. Other than at launch area there are cliffs along camping area along lake shore; Terrain: Level to about 7% grades. Cliff next to campground and in area; H2O/Water: Water normally murky. Water temperature in the summer can be around 60 to 70 degree. 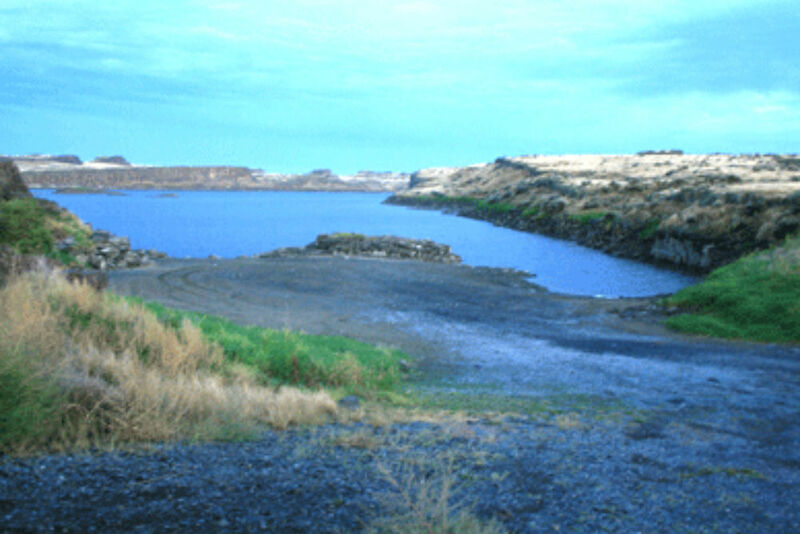 Drinking water not available; Environmental Conditions: High winds and hot summer temperatures; Resources: Food, drinks, and gas in Potholes Reservoir resort area. ACCESSIBILITY: PARKING... Gravel, sand, dirt combo parking areas; PATHS/TRAILS... None; RESTROOMS/FACILITIES/SHADE… No restrooms (fully accessible restroom up the road at Soda Lake Campground). Covered picnic areas. No trees; DOCKS/LAUNCHES/PLATFORMS… One wide gravel, rocky, sandy, muddy launch. No docks or platforms; DIRECT WATER ACCESS… No access for wheeled mobility devices. Access water via wide rough launch when no powerboats are present, assistance likely needed. Mud is deep in the water; TRANSFER SYSTEMS... None; SENSORY... No sensory tactile markers for those with visual and other impairments; CAMPING... No. 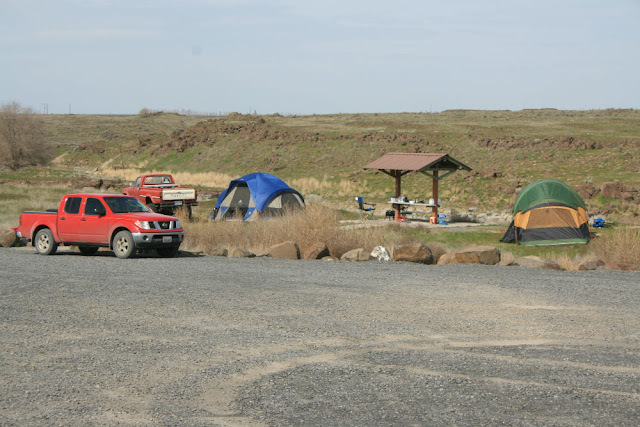 Camping up the road at Soda Lake Campground; O.T.H.E.R… Oddities/Barriers: Lots of sand and deep mud during wet times of the year at launch area. 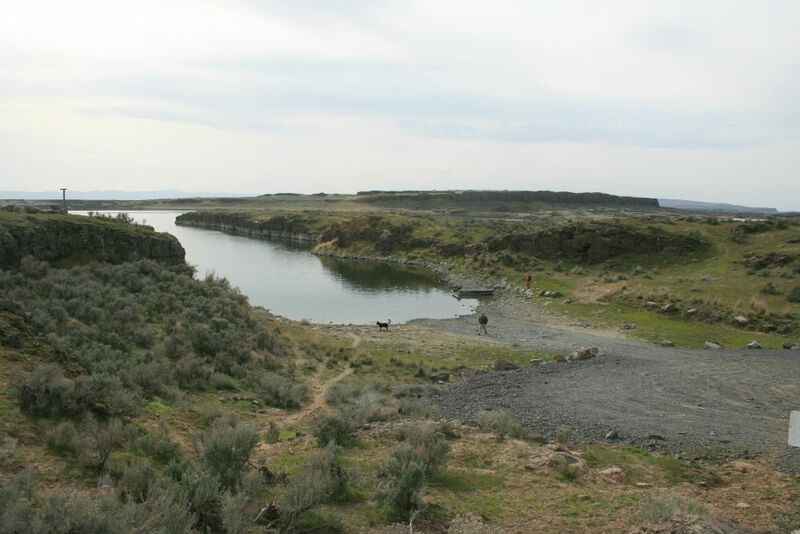 Other than at launch area there are cliffs along camping area along lake shore; Terrain: Level to about 5% grade; H2O/Water: Water normally murky. Water temperature in the summer can be around 60 to 70 degree. 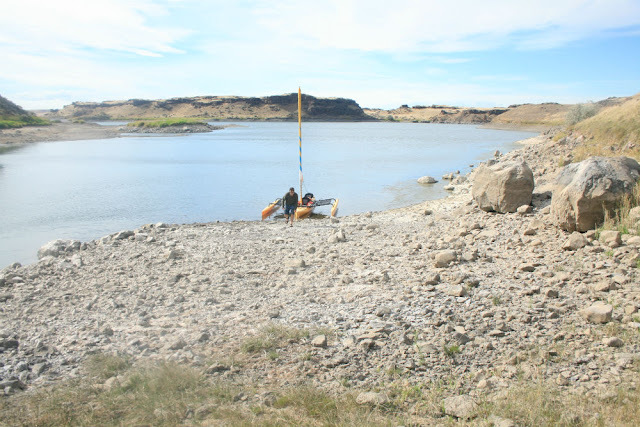 Drinking water not available; Environmental Conditions: High winds and hot summer temperatures; Resources: Food, drinks, and gas in Potholes Reservoir resort area. CAUTION this access site is at the mouth of canal to the dam. Stay out of canal leading to the dam, extreme currents! If you enter the canal you may not be able to get out Once in the short canal to the dam there are high vertical rocks walls that would be near impossible to climb. In addition there is extreme under-toe at the dam. So on the left side of the entrance to the canal there is a wide rocky gradual sloping area to take your watercraft out at. Portage up this area onto a sand trail past the dam to the canal edge. 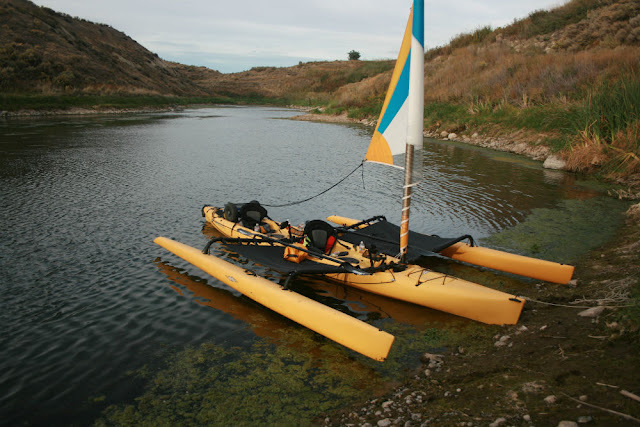 Use a rope/line to drop your kayak into the canal. At the canal bank it may be a 4-9 foot drop to your watercraft, requiring you to climb down rock climbing style with line attached to you and a buddy (never boat alone). 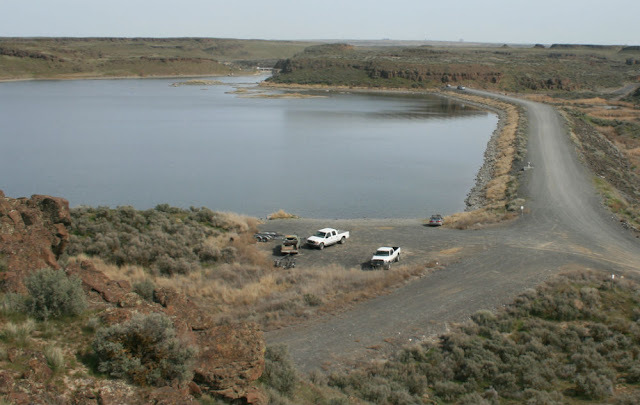 Driving Directions: From Moses Lake take HWY 17 south toward Othello; turn right (west) on HWY 262/O'Sullivan Dam Road. Before crossing the O'Sullivan Dam and after just passing the entrance to the Potholes Reservoir boat launch on your left/south is Soda Lake Road. Follow this road to past the sign indicating the Soda Lake Campground to the next sign indicating Soda Lake, Pillar/Widgeon Lakes. Follow this road past the Soda Lake boat launch on the dike to the end of this dike. At the end of this dike turn right/south and then east to the parking lot. From the parking lot take the trail east and then north past a small pond to the dam. Cross the dam and walk just a short distance west to view the wide access site. Maps: To view a map click on google.com/maps and type in GPS coordinates 46.957281, -119.230051 . CAUTION stay out of canal leading to the dam, extreme currents and undertow! This put-in just below Soda Lake Dam. There is no official put-in point just locate the most accessible spot. Be advised at the water's edge of the canal it's a straight 5-9 foot drop to the canal water. Directions above! ACCESSIBILITY: Not accessible to wheeled mobility devices. 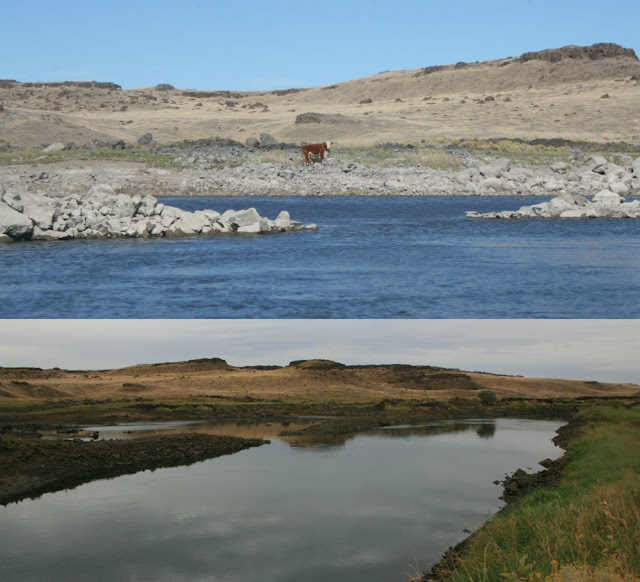 Wide part of the canal after Soda Lake Dam is called Elbow Lake and is a good place to fish and get out of the current. Info: Click here for more information about Elbow Lake. This lake which is another wide spot in the canal just before you get to Long Lake. This lake is a bit bigger than Elbow Lake. Its a good place to fish and to get out of the current. 3rd lake in Potholes Canal Chain Lake series. Info: Click here for more info about Pillar Lake. ACCESSIBILITY: Note that this is the last place as you paddle down the canal towards Othello with any level of accessibility to get in and out of the canal for those using wheeled mobility devices. The last stop on a trip down the canal is in Othello with zero accessibility for those using wheeled mobility devices. PARKING... Gravel, sand, dirt combo parking all along the east and southeast shore line; PATHS/TRAILS... Lots of dirt, sand, and gravel trails, none of which are designated as wheelchair accessible; RESTROOMS/FACILITIES/SHADE… Two fully accessible restrooms at the Southeast end of the lake. No designated picnic areas or shaded area. No trees; DOCKS/LAUNCHES/PLATFORMS… One wide gravel, sand. mud combo launch. No docks or platforms; DIRECT WATER ACCESS… No access for wheeled mobility devices. Access water via wide launch when no powerboats are present, assistance likely needed. Mud is deep in the water; TRANSFER SYSTEMS... None; SENSORY... No sensory tactile markers for those with visual and other impairments; CAMPING... Primitive camping along east and southeast shore; O.T.H.E.R… Oddities/Barriers: Lots of sand and deep mud during wet times of the year along shoreline; Terrain: Level to about 7% grades; H2O/Water: Water normally murky. Water temperature in the summer can be around 60 to 70 degree. 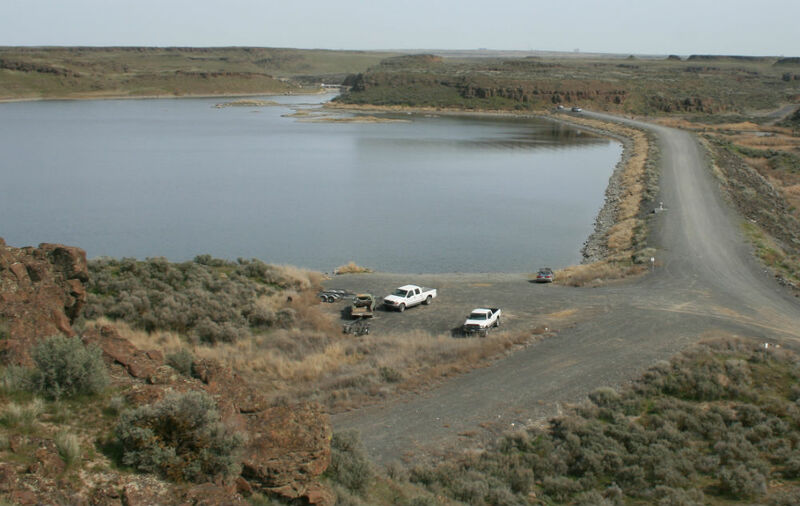 Drinking water not available; Environmental Conditions: High winds and hot summer temperatures; Resources: Food, drinks, and gas in towns of Moses Lake and Othello (Wal-Mart), and at Potholes Reservoir resort area. Sheep Lakes Road Bridge after exiting Long Lake. Clearance 12' Depending on water level. Many small waterfalls along the canal between Lower Crescent Lake and Othello. W. McManamon Road Bridge, Othello WA. Clearance 7' Depending on water level. 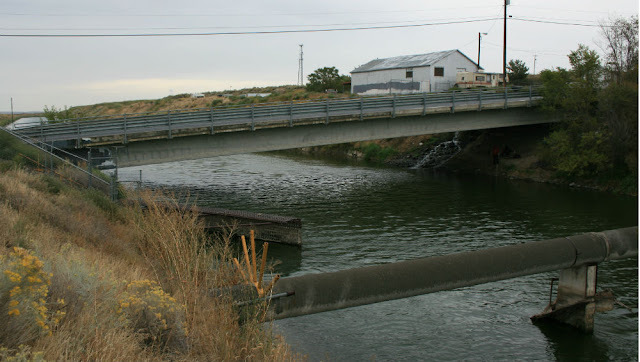 Steel Irrigation Bridge, Othello WA. Clearance 19' depending on water level. This Take-Out at Othello WA. is end of the line on this canal. Clearance under the bridge at this take out is about 6' depending on water level. 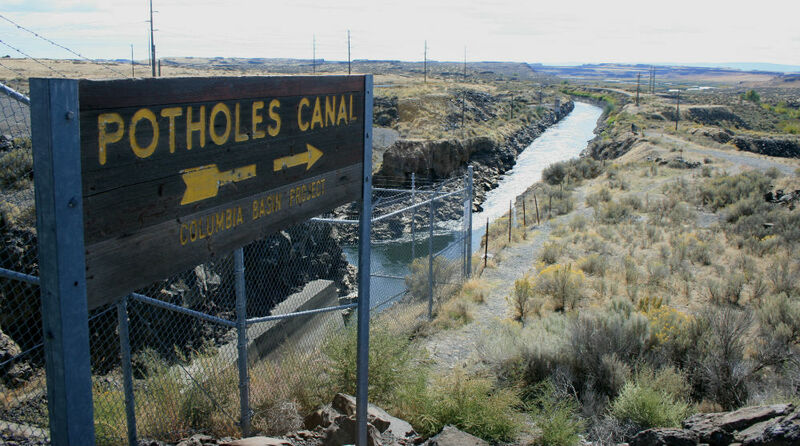 Driving Directions: From Moses Lake take HWY 17 south to Othello, WA. Turn right (west) onto W. Cunningham Road/E. Main Street. proceed through town. Proceed west through the cross street of S. Broadway Ave. stop light. Road turns into W. Main Street. Just after crossing S. Broadway Ave. on W. Main street you will come to a bridge. This is the place, park along the road by the bridge. The trail to the canal waters edge is on the south side of the bridge, then under it. Maps: To view a map click on google.com/maps and type in, Othello, WA. 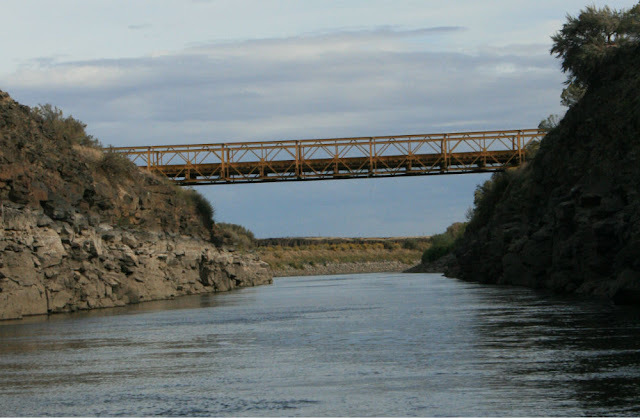 and follow directions to bridge or type in GPS coordinates 46.826230, -119.180136 . Interesting fact if you paddle from the North end of Moses Lake, then through the Potholes Reservoir, though the canal and chain lakes to this take-out its a total of 45 miles. ACCESSIBILITY: No accessibility for wheeled mobility devices. DO NOT PASS BY THE MAIN STREET BRIDGE TAKE-OUT because as shown in the pic below there are many pipes and low bridges passing over the canal after the Take-Out that are in the way of save navigation. You could get swept off your watercraft by these obstructions and the fast current adds to the difficulties. The water can be very cold significantly increasing your chances of drowning, along with the challenge of it being near impossible to climb out of the canal due to the steep and slippery banks.